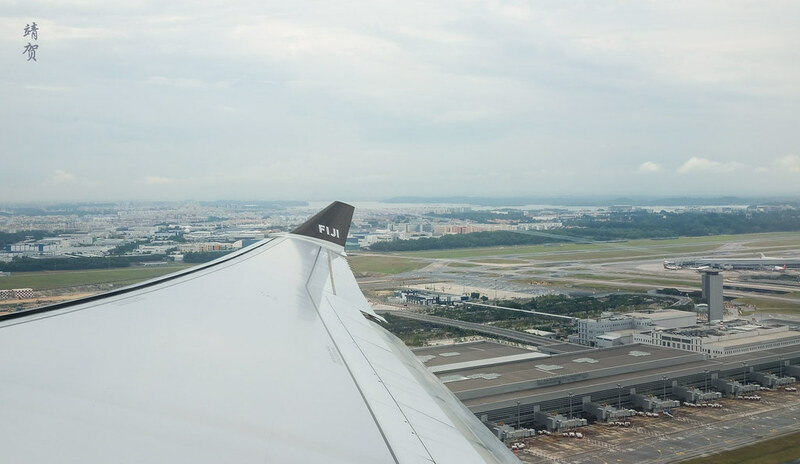 This was a trip I planned with a friend as Fiji Airways launched their new route flying between Singapore and Nadi three times a week and offered good promotional fares for connecting to New Zealand or Australia. For this trip, I planned to ski in New Zealand while my friend enjoys the beach which meant a stopover in Nadi to laze under the sun after skiing. 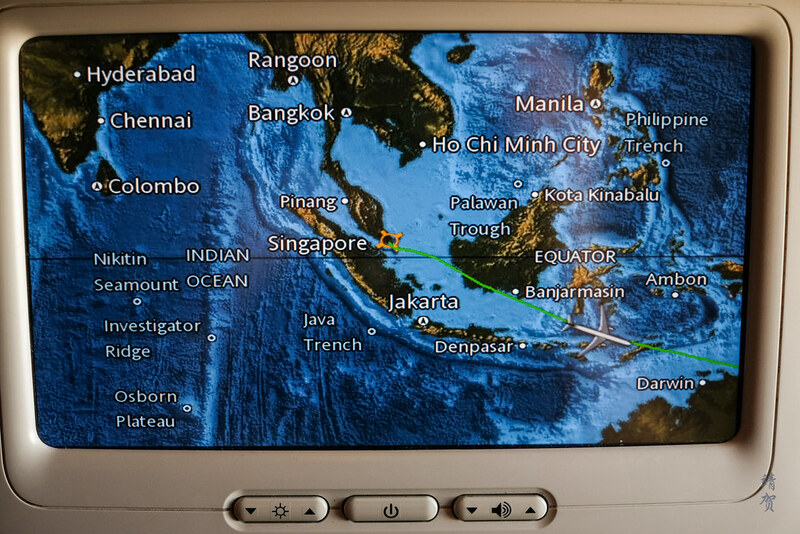 Since the flight departs out of Singapore, I purchased a separate ticket out of Jakarta to Singapore onboard Garuda Indonesia but as I have reviewed the flight before, I would skip that to the flight from Singapore to Nadi. Taking an Uber with my friend, we arrived at the airport slightly before 11:30am which was early. A moderate queue have already formed at the relatively small number of check-in counters that they have. Aside from the bag drop areas, there was 2 counters for Business class and 2 counters for Economy. Once we reached the front, it took a little bit more time for check-in as the staff had to verify my NZ visa and we needed to move to another counter. I double-checked with them that they would have charged me $180 for my ski bags as it is considered odd sized baggage, and I was glad to have researched on bag fees prior to my departure. Since this was an Economy class ticket, I did not bring my skis with me, and just checked in my ski boots. 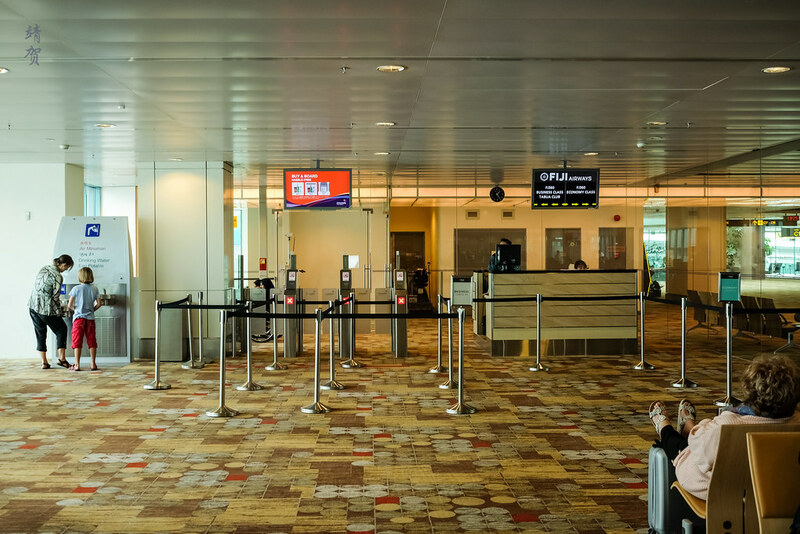 After checking, in we cleared immigration that is always pleasant in Singapore with short queues. That left us with more than enough time for a nice lunch at one of the numerous restaurants in the departure hall past immigration. The rest of the time after lunch was spent refilling our water bottles and sitting by the gate since security check is conducted at individual gates. Boarding was called at around 13:30, with business class boarding first before economy by the row number they are seated at. The rear row passengers boards first to have an efficient boarding. 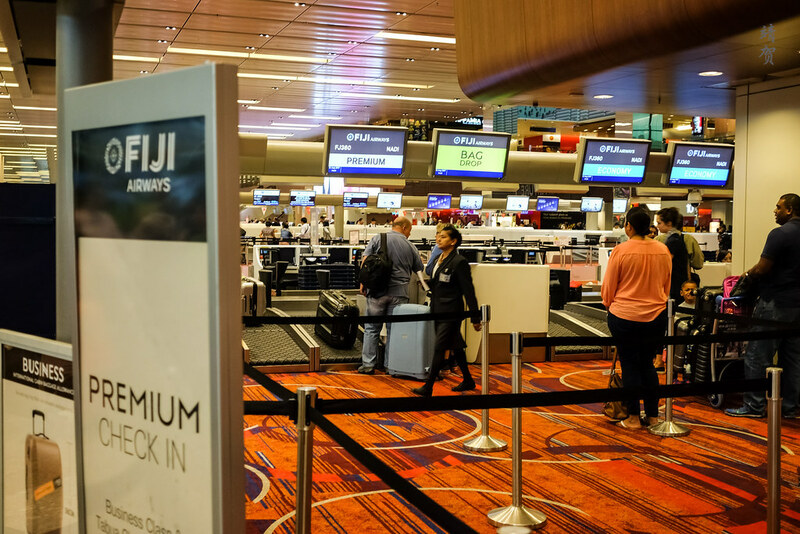 Fiji Airways Airbus A330 which they uses for long haul flights to destinations like Hong Kong, Singapore and Los Angeles has a premium feel with Business Class configured with the same regional seats found on Singapore Airlines Airbus A330 (meaning angled flat beds). Economy class was in a 2-4-2 layout and with just 2 of us, I chose the window and aisle seat combination. The seat was upholstered in a cream/grey palette. 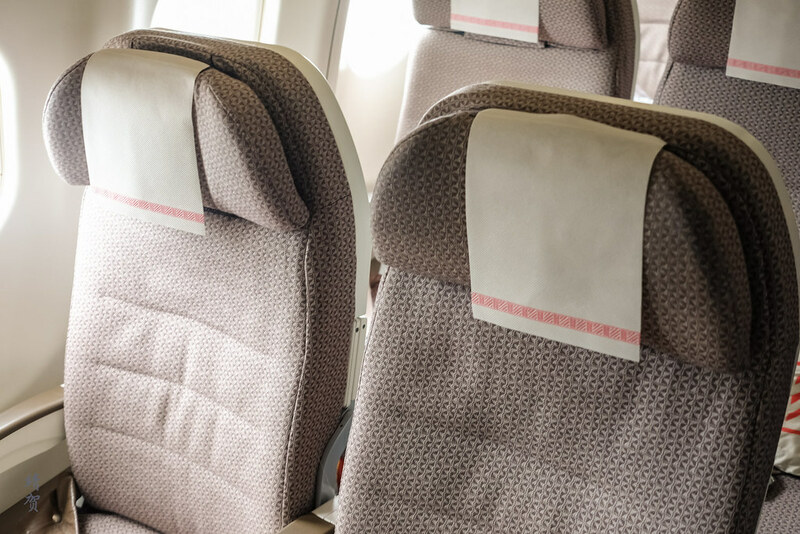 A small pillow and blanket was found at every Economy class seat, indicating a full service experience similar to boarding a Singapore Airlines plane. 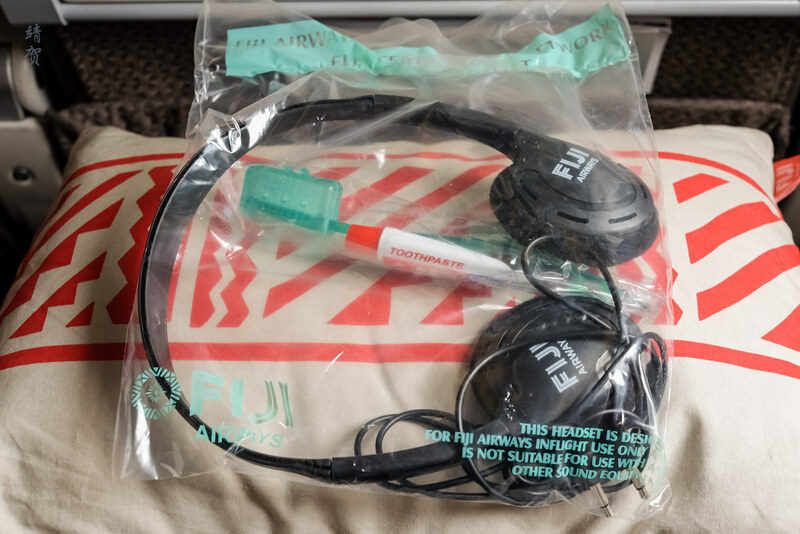 On the seatback pocket, passengers can find a sealed personal headphone along with a toothbrush and small tube of toothpaste. 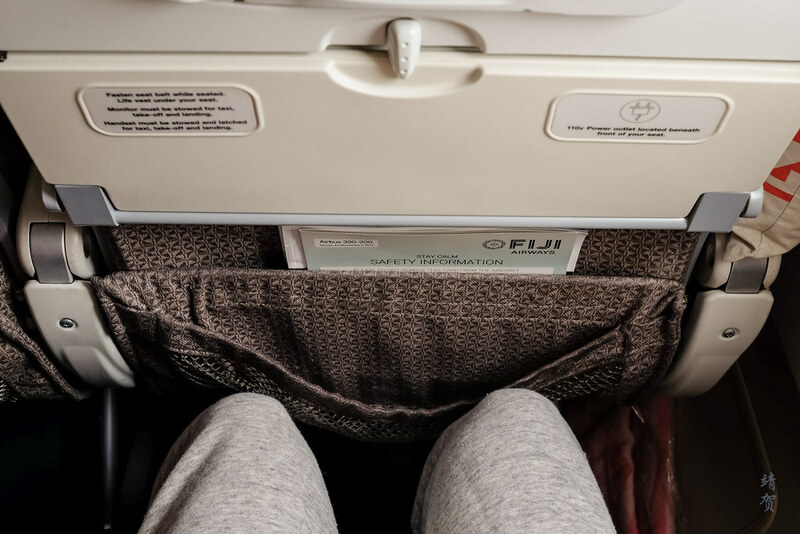 Legroom onboard the flight was adequate though there was no extendable leg-rest. 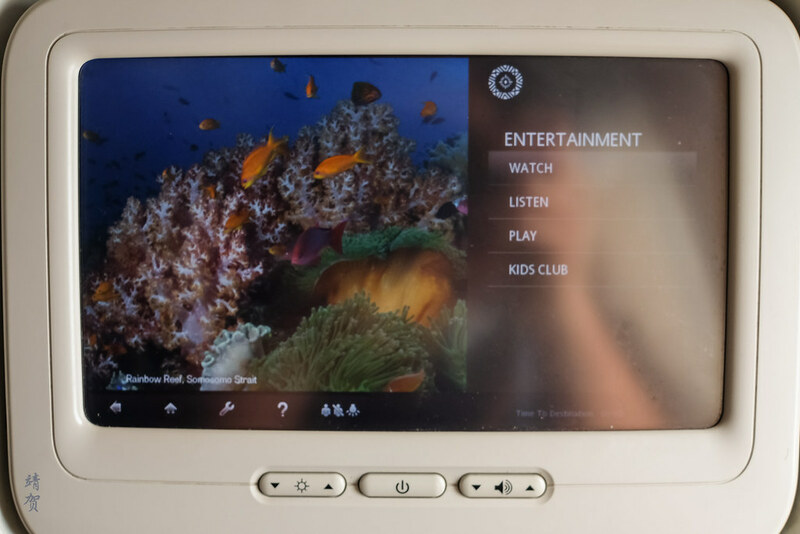 However, there was a personal entertainment monitor on every seat with a modern touch-screen interface. Flight was about 70% full with higher occupancy in Business class. 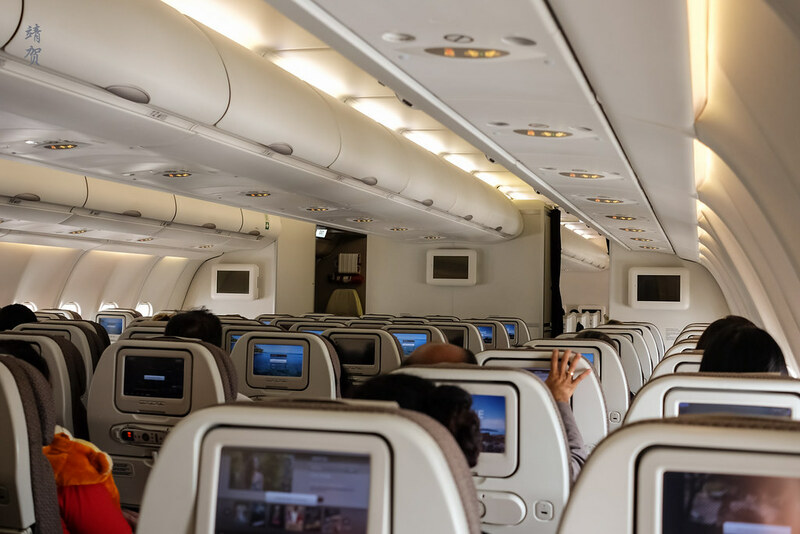 This meant there was several empty rows in the middle front section which the stewards allowed passengers to move toward after the flight have reached cruising altitude. 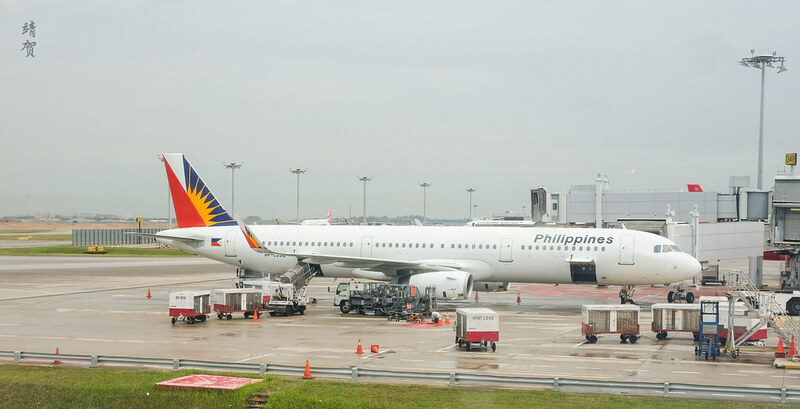 However, there was a slight delay due to the need to unload a passenger’s luggage who did not show up for the flight. Immigration forms to Nadi were handed out while on the ground. After pullback, a brief safety video was shown and there was a long taxi but not much of a wait in the runway for take off which was nice as we were already slightly delayed. What I noticed after take-off was the long time it took for the seat-belt sign to be turned off and the crew was really stern towards passengers who disobey the rule. While the crew was professional, they were not consistently so in the 4 flights I had as I found their service to be a bit slow. As the crew went around with the cart, I picked the chicken option while my friend opted for the fish. There was no menu for beverages but the usual soft drinks and juice options are visible on the tray along with beer. I was able to order both a glass of water and orange juice. On the meal tray, there was a fruit salad with walnut and raisins along with a butter roll for the appetizers. For dessert, there was milk pudding with sago and a small Toblerone chocolate. A pack of moist towel was included in the tray and made it easy for hygiene purposes. The small meal portion meant that guests with a heavier appetite should probably bring some snacks or sandwiches with them. As for the meal, I enjoyed the dish I picked and even finished the appetizer and the butter roll. 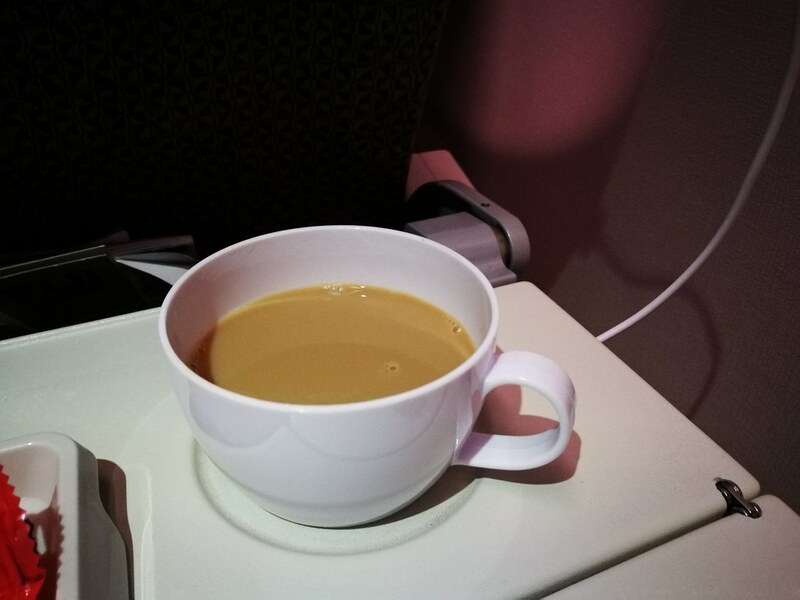 Halfway through the meal service, there was turbulence around Jakarta and eastern Java which stopped the service meaning the offer for hot coffee and tea was delayed. 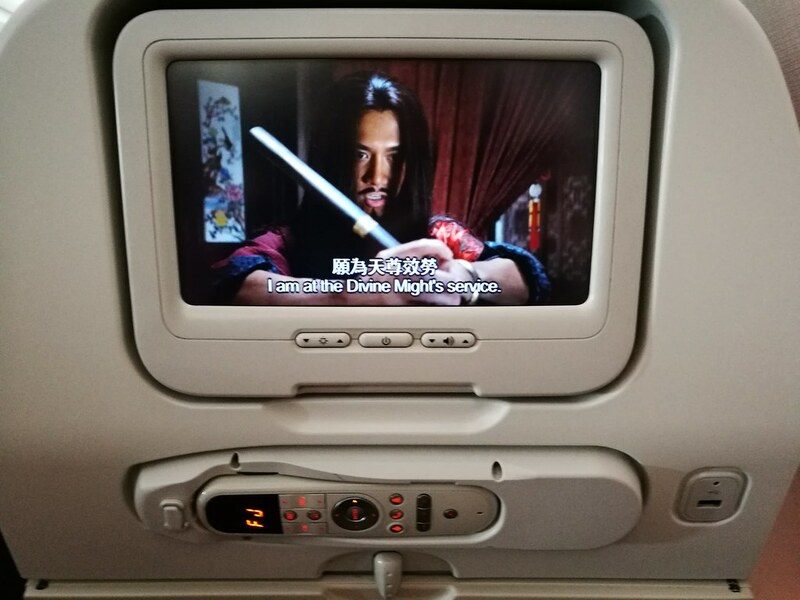 While enjoying my meal, I took the time to watch the Chinese movie ‘Sword Master’. 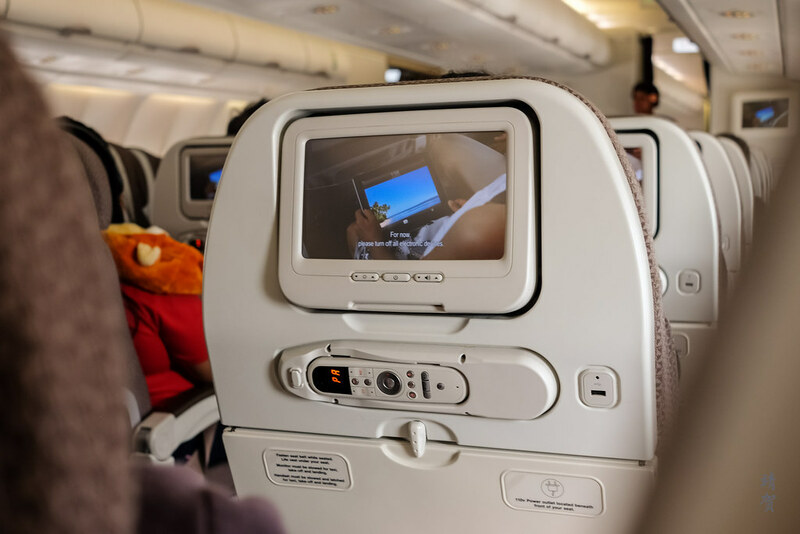 I found the selection onboard to be average since selection of TV shows was quite lacking and after 4 flights with them, I found myself pretty much running out of entertainment options. It was a while before the crew came back out with tea and coffee service. Then there was another break before crew came to clear the trays. 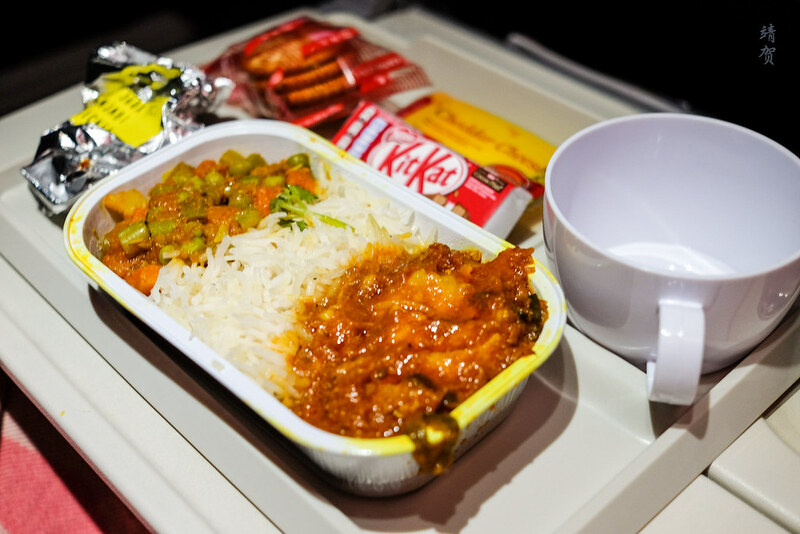 All in, the whole meal service took more than 2 hours from the moment the meal was offered until the tray was cleared and that is long in Economy class. What I appreciated was offers of water and wine by the crew as they went around the cabin after the meal service. 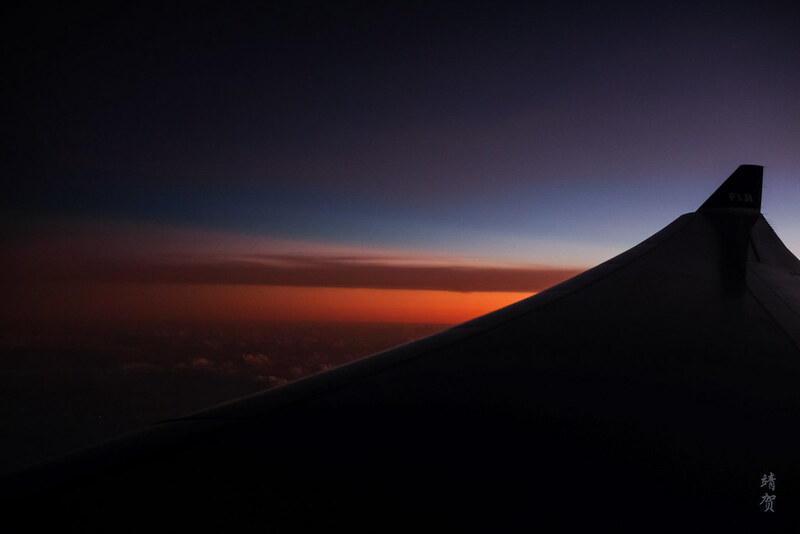 I passed on that and managed nearly 3 hours sleep as I reclined my seat after catching the sunset from the window. Surprisingly I found myself to be quite comfortable since I had the window seat and had some extra space to lean to the side of the plane. As I awoke, I noted there was periodic water rounds being made throughout the flight which is necessary since flying long distance can be dehydrating. 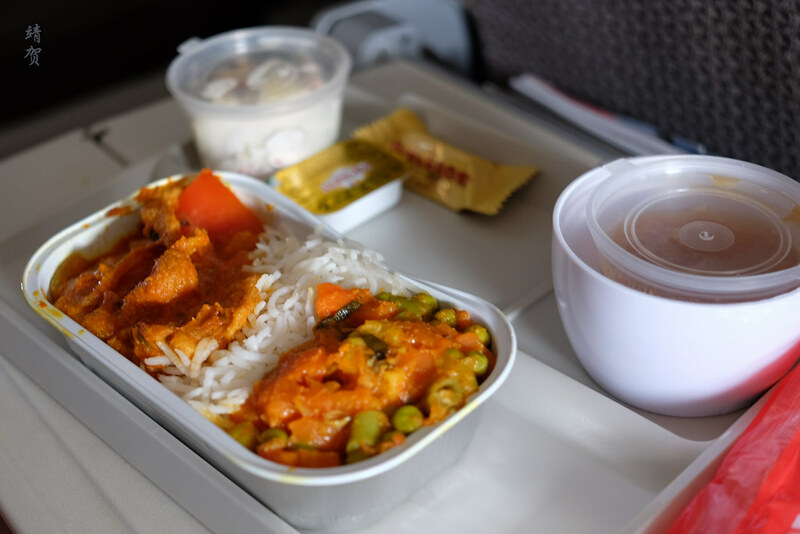 However, there was no offer for a mid-flight snack on this 10-hour journey and I had to request for some snacks from the back galley while I went for a restroom break. 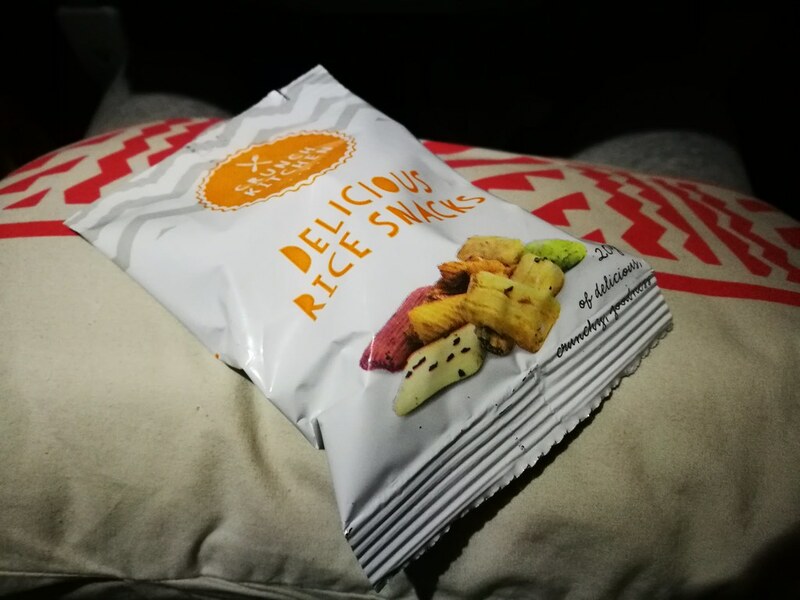 Fiji Airways only has rice crackers available though and I took a couple of packets. My interaction with the crew was professional during the outbound and they did their job with pride. 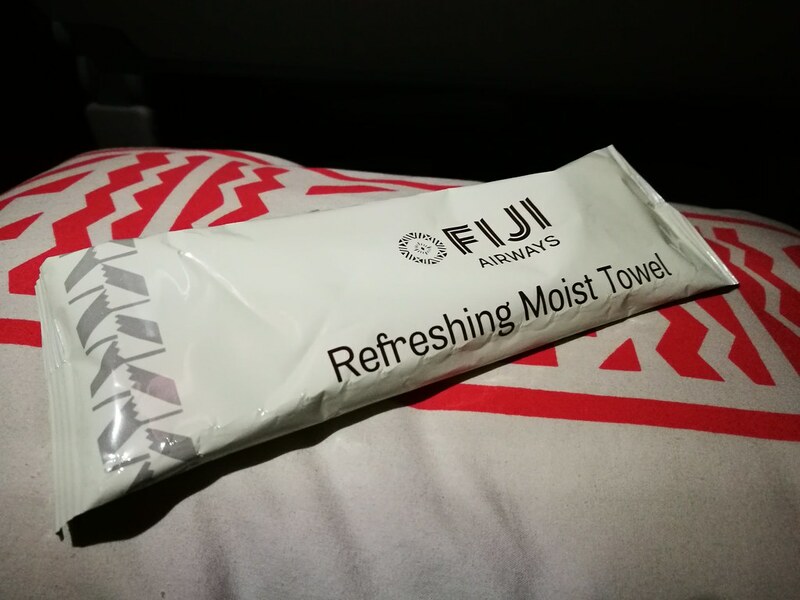 Packaged moist towels were handed out before the pre-arrival meal, which was served roughly 2 hours before our arrival. Coffee or tea was also served along with the meal tray. This time around I picked the beef stroganoff which was as good as I expected it to be since the beef was tender with adequate flavour to match the pasta. My friend got the chicken with rice option. 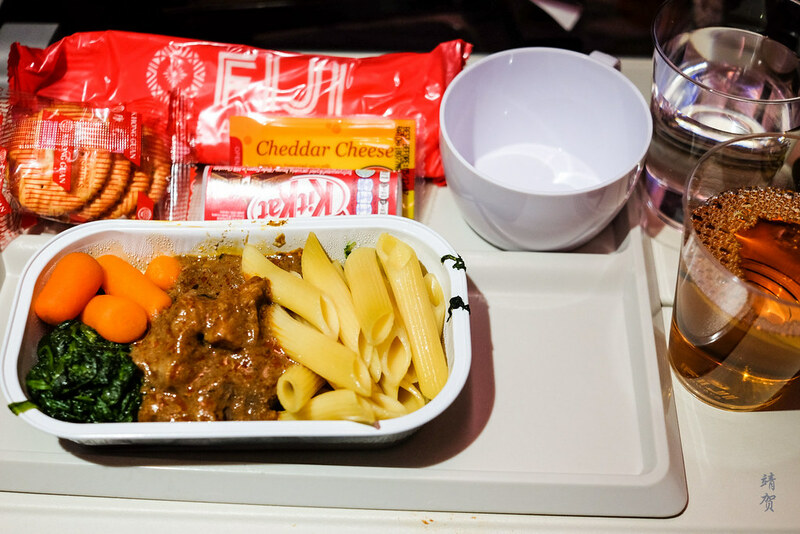 Both meals was a simpler affair as it contains just a pack of crackers and cheese with a small Kit Kat bar on top of the main course. Again, I asked for water and an apple juice for drinks. 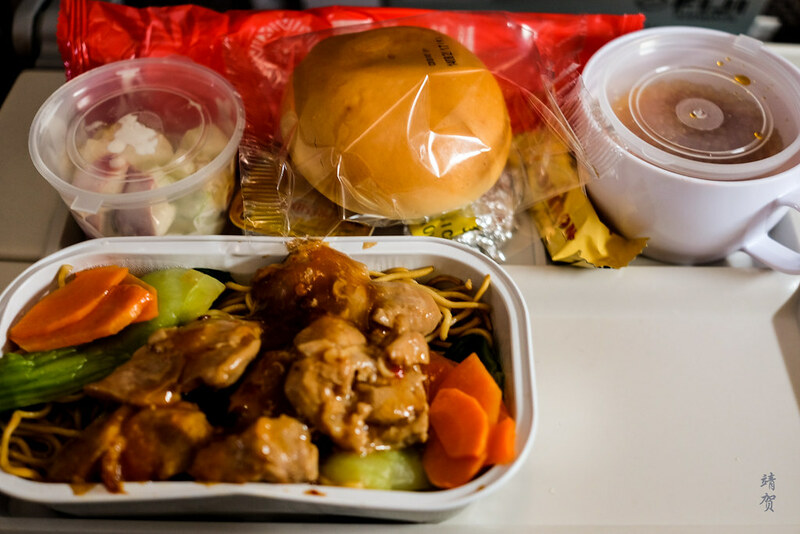 Due to the concise meal and, the service ended with more than 90 minutes before landing. 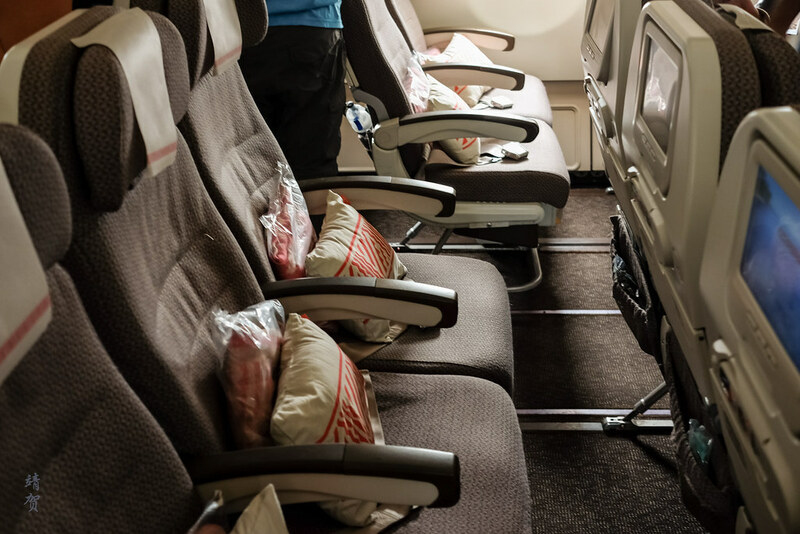 As the plane made its descent, the crew came around the cabin to collect used headsets and ensure blankets were placed on the seat or overhead. Passengers still watching their shows were allowed to keep the headsets as the inflight entertainment system was kept on until our arrival at the gates. 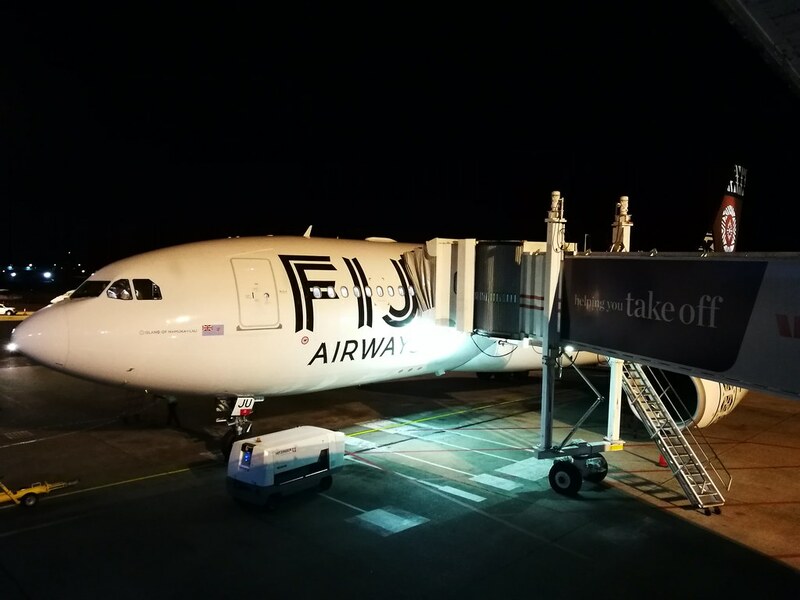 With the sky still dark outside, we had a very smooth landing in Nadi International Airport and on disembarkation, it was nice to get some of the cool sea breeze during the South Pacific winter season since the jetway was open-air. This also allowed me to capture some photos of the A330 that we took. 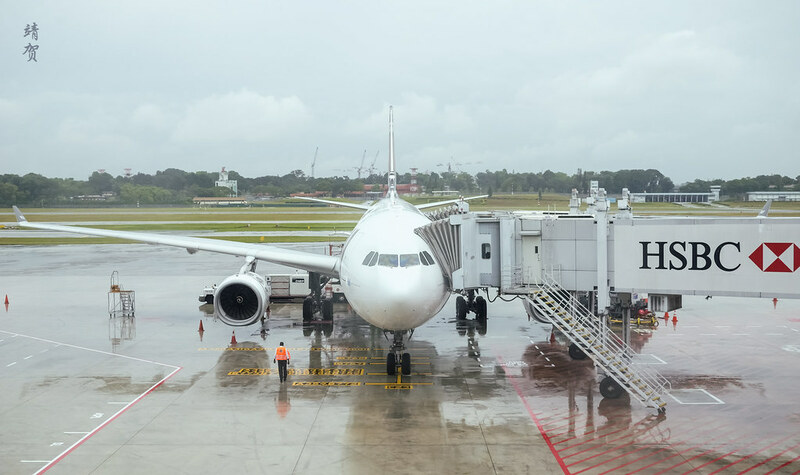 For such a long-haul flight, I arrived surprisingly alright in Nadi and I attribute that to the amenities that kept me comfortable onboard along with a decent seat pitch onboard Economy class with a respectable recline. The timing of the flight was great as well since it allowed guests to sleep in between the meal services as the sun sets. 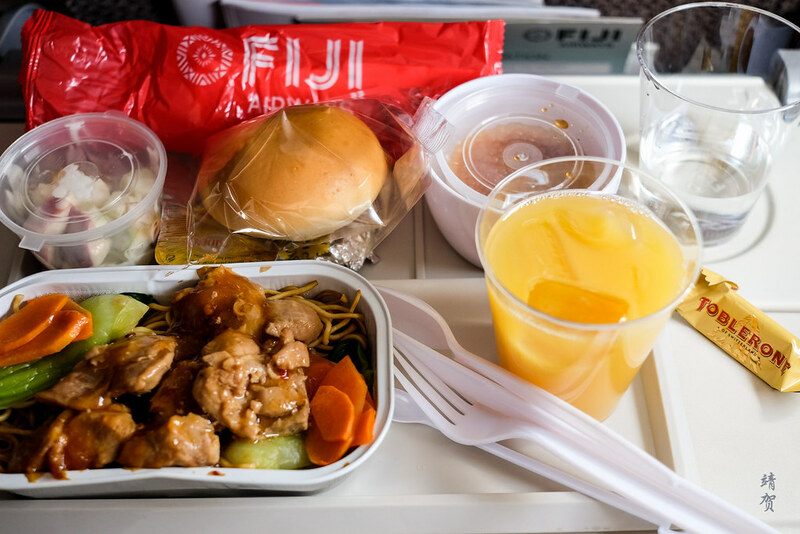 With pretty tasty meals albeit in a smaller portion, I would not hesitate flying with Fiji Airways long haul in Economy class given their reasonable fares. Great to see the start of this trip report!! 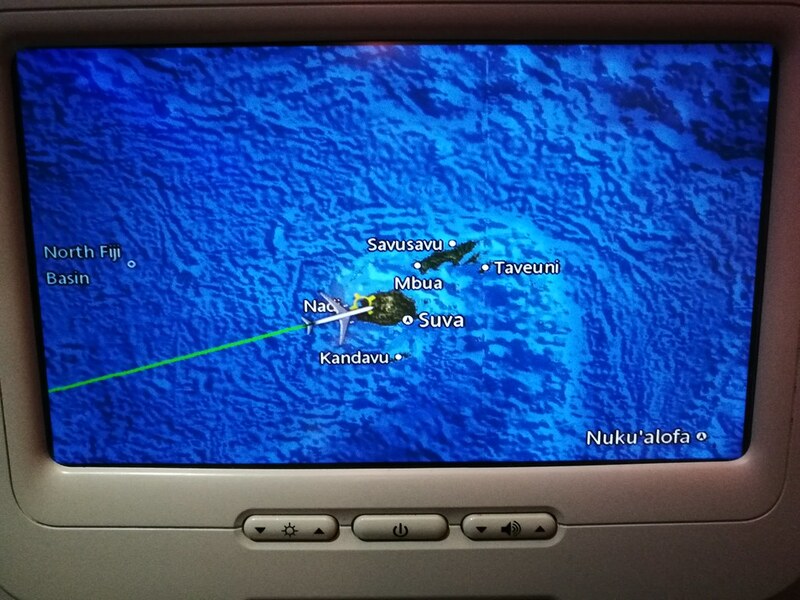 Unfortunately, Alaska Mileage Plan hasn’t opened the flood gates for award travel from Americas to Asia via Fiji. I would love to try this route if they did. Who wouldn’t appreciate a Fijian stop over on the way to Asian. That would be a long route and reserved only for the aviation enthusiast! But it sure would be nice to break the trip with a beach vacation!